Listen up, everybody! Mister Tom Angelripper has important things to say on the subject of the brand-new SODOM EP Sacred Warpath, on the state of the world and on life in general. He's really vented his feelings: "Since we've been getting the impression that the world is falling apart at the seams, we've decided to make our voices head ... while there's still time. 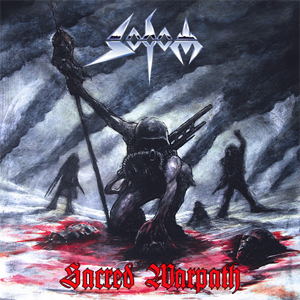 Sacred Warpath was originally written for our upcoming album, but we feel it's a good idea to release it now as an appetizer for future SODOM tracks. Because it's going to get raw, brutal and will be a reflection of all the things that we're afraid of and that give us nightmares. Pretty much like that hate-filled world we live in. And it's probably more authentic than any of our releases so far." Tom Angelripper on the bonus material of SODOM's new EP: "The record includes three representative titles which we recorded in Germany this year, and it's guaranteed to become a rare collectors' item. The cover will feature a re-paint of an old design from the 80s, which I did for a demo cover, painted in oil by Christian Ermel. This may all sound a little old-school, but that's intentional. That's what we've always been and always will be about. We very much hope to tie over the waiting time until the arrival of our new album. And now listen to my unmistakable demand on this world: turn back on your sacred warpath and find the path of peace before it's too late. Our music will help you!" Sacred Warpath will be released worldwide through SPV / Steamhammer on November 28th in Germany, December 1st in Europe and late January 2015 in the USA as CD, 10" clear vinyl (limited to 1.000 copies) and download.